Lock in a great price for Boutique Hotel Heidelberg Suites - Small Luxury Hotels of the World – rated 9.1 by recent guests! Enjoyed calm and relaxed place with a great view and proximity to old center. Very helpfu and assistive staf. Liked very much Maria's friendliness! Very friendly and nice staff. Valet parking is a plus. Good view on the Heidelberg and river. Room was a bit small but very comfy. Excellent location, very nice staff, very good breakfast, very nicely decorated hotel, every thing was good. I love everything there especially the view and the location. The staff and the room is clean. Felt like home. Incredible property, great staff, breakfast was fabulous. I can't wait to come back! This hotel is a real gem! We were traveling because of a medical treatment and needed a comfortable place for my husband to relax for two days.... and we left feeling as though we had had a mini-vacation. The spacious suite, the charming young people at the reception, the comfortable bed, the well-stocked mini-bar, the comfortable wing-back chair at the window in the living room with a view of the Heidelberg castle, breakfast with personal attention and perfectly cooked eggs, help with parking our car.... What more can one hope for when booking a hotel. We ate dinner on the ship Patria - a wonderful, unique (delicious) experience and our surprise and pleasure were complete when the boat took us on a one-hour tour on the Neckar during dinner, passing the illuminated castle, enjoying the spring air and views in the fading sunlight. Perfect! This place was absolutely exceptional! Right on the river, gorgeous views, gorgeous rooms & absolutely wonderful service/staff. Also, the breakfast spread was incredible. Location is great - 10 minutes walk to the castle and most of the shops/restaurants. 10 minute taxi to the train station. Breakfast buffet was a good spread and hot breakfast made at request. The staff were very cheerful, friendly and attentive. Rooms were beautiful and comfortable with great views. Staff was wonderful and very helpful. Breakfast was great! Good location. Close to old town. 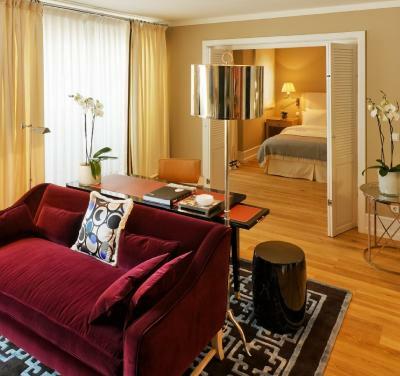 Boutique Hotel Heidelberg Suites - Small Luxury Hotels of the World This rating is a reflection of how the property compares to the industry standard when it comes to price, facilities and services available. It's based on a self-evaluation by the property. Use this rating to help choose your stay! One of our top picks in Heidelberg.These suites and apartments provide a beautiful place to stay in Heidelberg. They are located on the River Neckar, next to the Old Bridge and a short walk from all attractions. 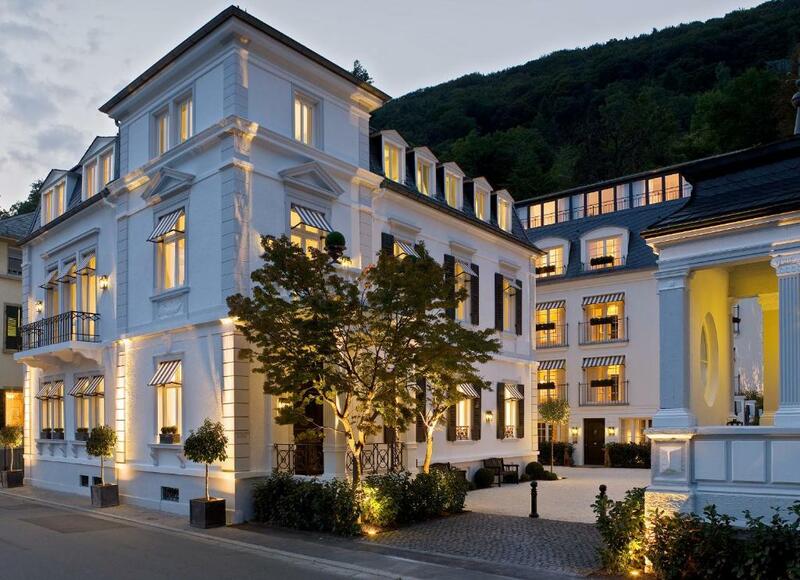 Heidelberg Suites is a boutique hotel on the site of a splendid villa with a private spa, which was originally built at the turn of the 20th century. 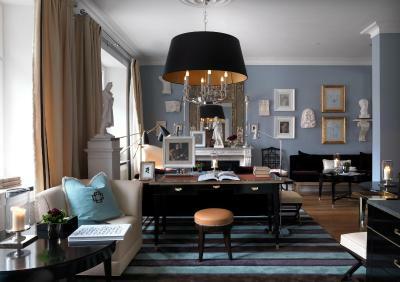 The suites have been meticulously restored and stylishly designed by an internationally renowned architect and designer. The rooms and suites at this Small Luxury Hotels accommodations offer all modern amenities to ensure guests a comfortable stay. Most offer a view of the Old Bridge and Heidelberg Castle. 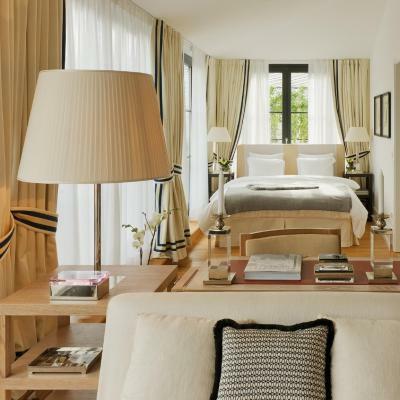 The luxury accommodations combines Italian architecture and German romanticism. Guests can have breakfast and enjoy a diner tasting fish specialties in the in-house Scharff's Restaurant, located on a ship overlooking the river. A limited number of parking spaces is available at the property, and there is a public car park 2,650 feet away. Guests are allowed to drive up to the property to drop off and pick up their luggage. Neuenheim is a great choice for travelers interested in architecture, romance and walking. This property is also rated for the best value in Heidelberg! Guests are getting more for their money when compared to other properties in this city. 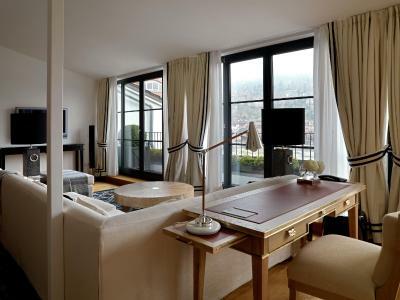 When would you like to stay at Boutique Hotel Heidelberg Suites - Small Luxury Hotels of the World? Air-conditioned suite with elegant décor and a flat-screen TV. Extra beds for children are available on request. Located in the historic villa or new garden villa. 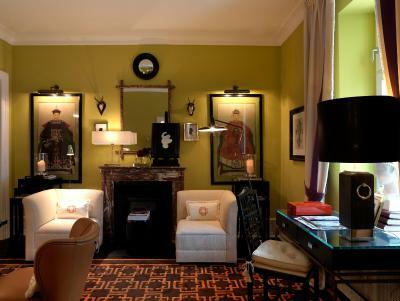 Featuring a bedroom and a living room with kitchenette, sofa, big armchairs and a desk. Includes a flat-screen satellite TV and an MP3 docking station. Hotel surroundings – This neighborhood is a great choice for travelers interested in architecture, romance and walking – Check location Excellent location – show map Guests loved walking around the neighborhood! 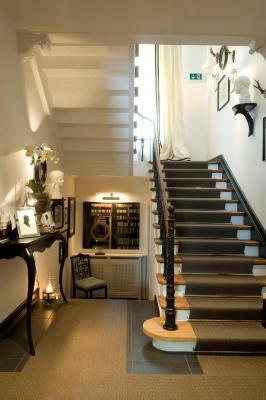 House Rules Boutique Hotel Heidelberg Suites - Small Luxury Hotels of the World takes special requests – add in the next step! 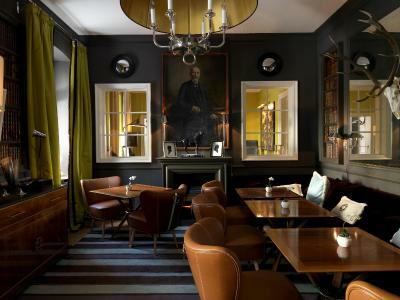 Boutique Hotel Heidelberg Suites - Small Luxury Hotels of the World accepts these cards and reserves the right to temporarily hold an amount prior to arrival. Please note there is no elevator in the annex. Location. Little touches. Great beds. Everything was outstanding. Luxurious with class. Breakfast is fantastic in a lovely room with excellent service. Very attentive staff, helpful and ready to provide information and advice. 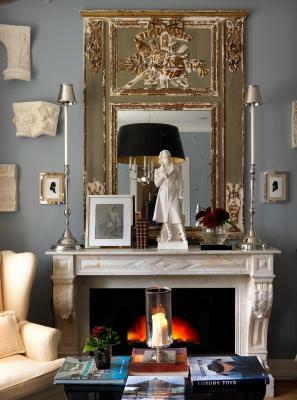 Decor if the rooms is gorgeous. Nice location and view. Very good breakfast and well presented. The shower lacked a proper shower screen and water went everywhere in the bathroom. The bottom of the bathroom door is rotting no doubt due to so much water. Everything was good enough. The staff were excellent. Although we had booked one of the most expensive rooms at the hotel the bed was a catastrophe. Totally worn out a disgrace for such hotel standards and such price. Also, for all the guests a warning ! - the hotel is next door to a school- very laud, seriously laud environment - is not being mentioned on booking.com nor on the hotel own website the information of the school being next door. Not okay! Great team at the reception. Very supportive, accommodating and professional. 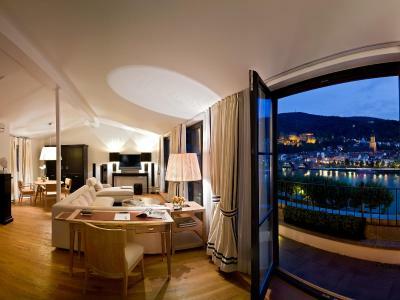 Our suite, number 1 has a wonderful view over the old city of Heidelberg. Not everything was up to standard. The bathroom was the smallest i have ever seen and the shower was faulty. A few other things were wrong. No restaurant or manned bar. Overall very expensive for what it is. perfect for a short stay and visit of Heidelberg. Rooms are cosy and comfortable; breakfast is lovely.